The Cultural and Historic Ensemble of the Solovetsky Islands is a medieval Russian Orthodox monastic settlement in an inhospitable environment. The Solovetsky Islands are an archipelago situated north of St. Petersburg. There are about 100 islands, inhabited by only 1400 people. 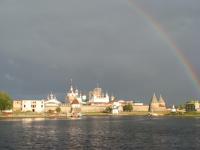 Greater Solovetsky Island is the biggest, on which the famous medieval monastery and Kremlin is built. Its beginnings as a religious center date to the mid 15th century: in 1436 the monastery was founded. The complex also includes a monastic village and a number of detached monasteries (on other islands too). In 1920 Solovetsky Camp became the first Soviet concentration camp, on the grounds of a former monastery. People persecuted by the Soviet government were sent here, and it became a model for the gulag system that later spanned the country. Later it was turned into a naval base. Its monastery function was restored in 1990. Unfortunately I couldn't attend WHS get-together event, as I booked the trip to Solovetsky islands, my old and much wanted target. The trip was by air, through Arkhangelsk first and then by a bit scaring 40-years old AN-24 turboprop airplane. So-called airport (in fact, just tiny wooden blue construction) is located just 1 km away from the monastery, which immediately dominates the skyline and creates fairytale spiritual atmosphere. We explored the monastery and the island for the 2 days, however the weather was quite rainy and changed so quickly that we haven't completed our bike tour to the Northern part of the island. The main island is not a much visited place by toursits even in August (mainly we met pilgirms). Howver during our stay we intersected several time with a brave group of 20 British tourists, mainly pensioners, who were visiting a number of interesting places on the Russian North (Kizhi and Ferapontonv included). We chattered a bit and advised to visit special exhibition in Arkhangelsk, where they were heading next, dedicated to 75th anniversary of Dervish - American-British Ally marine convoy, which during the war transported numerous strategic aid to the USSR. This help will always be kept with remembrance and endless respect. Unfortunately, the monastery is currently under repairs ladders (till 2017), and the pictures will not be so photogenic as in the books. 3-hour excursion to the monastery is worth 450 Roubles (6.5 Euro). There is quite an extensive excursion program around the islands in both decent hotels on the island, Solovetskaya Sloboda and Solovki-Hotel. In order to cover all the interesting sites (including neighboring islands) at least a week is required. From June till mid-July there is possibility (northern weather permitting) to go on white whail-watching boat tour. Also we recommend to visit Marine museum (opposite monastery), which has interesting collection from every day life of "pomors" - coast-dweller, who inhabited this area. I was a little bit dissapointed, because out of 5 churches inside the monastery, only one is accessible nowadays, and unfortunately no original interior has left, everything was destroyed during dark and sad Soviet GULAG times. Currently there is temporary iconostasis, which will be replaced by 2017 with the new original one. The area inside seems in process of revitalization and improvement. In any case, the severe and moss-covered towers and walls constructed with huge boulders provide deep and lasting impression. The monastery (probably could be compared to Skelig) is the living testimony of faith and spirit triumph in the extreme surrounding conditions just 150 km away from the Polar Circle. We liked the place and surely hope to return for a longer stay to cover numerous attractions and sites in the area. Our local tasty favorites not to be missed – Solovetsky herring and cod cake washed with local liqueurs made from cloudberries and cowberries. 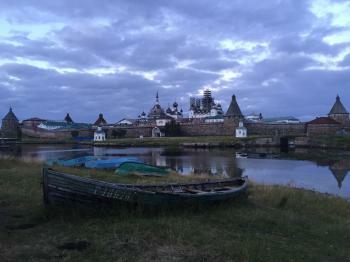 If you want to visit solovetsky Islands, you have at least two possibilities to do that. The simplest is taking a plane from Arkhangelsk (around 300 USD roundtrip, depending on the booking period). More difficult, but also more rewarding is by train from Sankt Petersburg (around 20 hours) or Murmansk (11 hours). Being in Murmansk I could not skip this place so I went there with my friend, taking a place in plackarta for around 40 USD one way. We left the train in Kem, a town in Karelia in the early morning, then taking a taxi to Rabotsheostrovsk (around 10 USD for 20-minutes trip, during the day there are shuttle buses for 3 USD). From Rabotsheostrovsk we tried to catch a ferry to Solovki, but the tickets were already sold. I recommend booking them in advance then. However, we took the ferry for pilgrims operated by the monastery, paying even slightly less (RUB 750 = USD 25) than for the civil ferry. After almost three hours we finally reached Solovki. Solovki are the place with extremely complicated history. From XVth century the place served as monastery and hermitage for the most devoted Orthodox monks, becoming during the ages one of the most important centre of Russian Orthodox church. The Bolsheviks, after taking over power in 1920s, wanted to kill to birds with one stone by closing the monastery, expelling the monks and using this place as a first GULAG (called SLON – Solovetsky Special Purpose Camp) in the empire. Solovetsky camp was one of the harshest in the Soviet Union (the conditions were widely described in Solzhenitzyn’s famous The Gulag Archipelago) and became the symbol of the Gulag system. 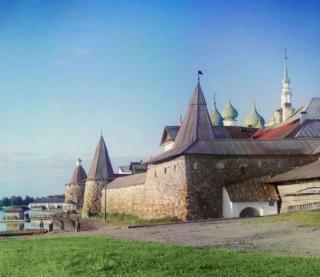 From 1992 the monks came back to Solovki and from then the monastery reopened. Now undisputedly the most impressive place in the archipelago is Solovetsky Monastery, rounded by high walls made from huge stone blocks. The wall looks really amazing and I dare say that is more interesting than the monastery itself. Now, all buildings are subject to wide renovation but there is still lots of work to do. If you like the sumptuousness of the Russian Orthodox churches, Solovki is not a good place to visit. The walls are plain white and it is visible that the monastery was as a center of pure faith, solitude and atonement, rather than for flamboyant ceremonies. The must see place is also the museum of the Solovetsky Gulag, located a few hundred methers from the monastery, in the original camp building (actually, many of them, initially occupied by the camp administration, survived until now). I could not omit a small memorial valley with a stone devoted to the Polish prisoners of Solovki camp. After spending a couple of hours we took a ferry back to Kem and then train to Murmansk, but after three weeks we came back to Solovki on a yacht and spent a night there. Canals: Made by monks between the 16th and the 20th centuries, the canals connect over 60 lakes on Bolshoi Solovetsky Island.